Clemson Girl: Quick Poll: Would you wear these flip flops to a Clemson game? Quick Poll: Would you wear these flip flops to a Clemson game? 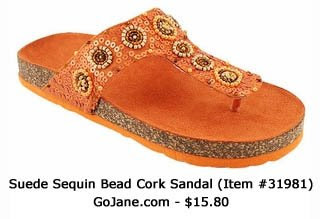 Image from GoJane.com - See more info and purchase here. They are cute, especially for the price! I would wear with flood crops or a dress! Those are so pretty. I would wear them anywhere that was dry enough for me to be comfortable in them. Flip flops are so easy to get around in- most of the time. You have done a great job on this article.Thanks for sharing among us.If you have any problem related to the PC and Laptop then you can contact us we are here to provide you the complete solution to your problem. I really love this, if you have any problem regarding dell tablet support you can call toll free number +44 800 014 8212. I needed to thank you for this incredible read!! I unquestionably adored each and every piece of it. Nice and helpful information shared by this article with us and I hope that we will also get more new information regarding this post as soon as. This information is valuable for most of the users. This is really marvelous post and very informative there is no doubt about it. Hello, thanks for the sharing, i am waiting your next post, This site has informational purposes and it gives a lot help. Hello, your article is really amazing...all of the words in the article is really so much helpful for me and also I guess lots of people whosoever read it. you really explain so well that all things get easily understand. thank you for share your words and keep share it. Here I am also like your post as others are like it is too good. I am certain that this content might be beneficial for most of the seekers. Continue sharing your thoughts and keep us updated. Hello, Thanks for sharing such type of nice and helpful information with us and I hope that we will get more new information regarding this post in the future.